In this guest post, Carly Ledbetter explains how she got started as a travel blogger and copywriter. Before I left the US to study abroad in London, one of my professors gave me a simple request, ‘Write a blog’. My first thought was quite the opposite – no way was I going to write a blog. Who would want to read my writing? I’m boring and won’t have anything to talk about! Even though I’ve been writing since I was very little (probably around 5th grade), I’d only ever shared travel journals with family or close friends. Having my writing out in the open, on the Internet of all places, was not only daunting, but potentially very embarrassing! Just to spite my professor, I ended up going to Barnes and Noble to buy a notebook. On the plane ride to London I began to scribble away, but by about Day 3 I was itching to try my hand at travel blogging. I’d read my flatmate’s blogs, and I figured that I could give it a try. I wrote my first post, named it something inappropriate (Bonking Norah), and then emailed the link to my family. Being family, they praised my work and encouraged me to share it with other people. I figured it wouldn’t hurt to try, so I started sharing my posts on Facebook. I never took my laptop when I travelled because I stayed in hostels and was too cheap to pay for a storage locker. Within ten minutes of posting it, Bonking Norah took off. Friends started commenting on the blog, sharing posts, and messaging me their concerns about my well-being (I have a knack for getting into trouble). In a few short days I would go from being too embarrassed to post to tracking page views on Google Analytics. I was so excited that people were reading my writing that I almost started doing crazy things just so more people would read it. 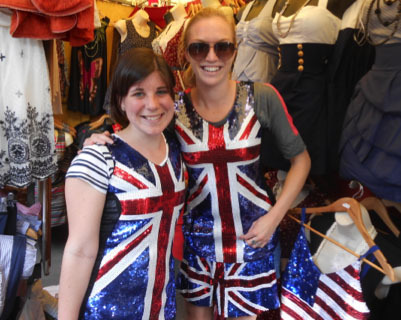 Carly and her friend were very serious about Jubilee Weekend in London. Along with the joys that normally accompany writing and telling stories, there were also a few difficulties. For one thing, my embarrassing moments on the trip were out there for everyone to read, and I had to be okay with that. I also never took my laptop when I travelled because I stayed in hostels and was too cheap to pay for a storage locker that still might get broken into. That meant keeping notes in my phone, or writing down things the old-fashioned way (which I actually prefer). At one point during the summer, my computer stopped working because of the amount of pictures and videos that I’d loaded, so I’m still uploading old posts from nearly a year ago. Despite these difficulties, I was still able to attract thousands of views and entertain a lot of people. But the reason behind the success of my blog was not necessarily because of my writing style or my lack of grammatical knowledge – Bonking Norah was successful because I had great adventures and then wrote about them. Ryan Holiday, a successful, young American writer, wrote an amazing article called So You Want to Be a Writer? That’s Mistake #1 about not just becoming a good writer, but ‘do[ing] interesting things’. It’s an important article that I not only totally agree with, but I think every single budding writer needs to read. Even though I’m still updating my blog a year later (which makes it less timely or relevant) it’s okay because people are still interested in the things I did. My adventures were not only fun, but they also landed me a job. 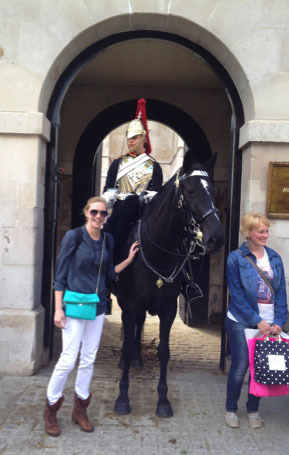 Blogging about my experience in London literally changed my entire career path during the summer before my senior year of college. I went to London for a legal internship, but found that the moment I looked forward to the most was writing my blog before I went to bed. When I returned to the States, I knew that I wanted to forgo law school (at least for the time being) and try my hand at being a writer. The change in careers paid off, and I’m now employed writing for GetDirectTV. If you go to the website, you can actually see the copy I’ve created for Internet customers. Writing for my day job just makes it all the more fun to come home and write for awesome blogs like this one. Bonking Norah was successful because I had great adventures and then wrote about them. The professor that encouraged me to write the blog while I was in the UK emailed me during the height of my blogging that summer. She loved that I’d taken her advice to heart, but had one piece of advice left for me, ‘Learn to use a semi-colon properly’. When travel-blogging, one can only focus on so much. But focus on the adventures, and the rest should follow. Happy writing to you! 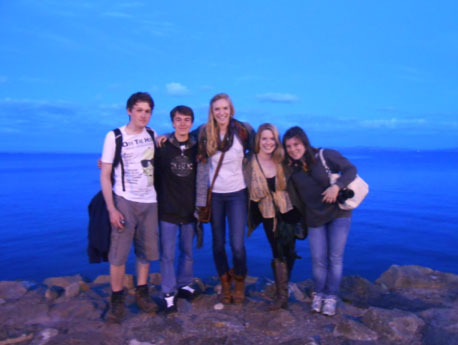 Carly with new friends in Galway, after a Mumford & Sons concert. Today author Cameron Rogers talks about working with publishers, using a pen-name, having an agent, and what promotions support emerging writers can expect from publishers. Cam, with your novels, what do your publishers expect from you in terms of rewrites? It varies from publisher to publisher, editor to editor. A good editor understands what you’re attempting to do with a given manuscript and helps you work in that direction. Another editor may have a more commercial mindset and ask that the main character of your period drama be more like Starscream from Transformers. I wish I was making that last bit up. But generally, I have to say, I’ve rarely come across an editor I had a hard time working with. The key, for me, is understanding that the end quality of the manuscript is more important than anything else, including your ego. You need to be okay with amputating whole chapters – months of work, maybe your best work – if the end result for the reader is greatly improved. How do you find switching between novel writing and travel writing? Does one style of writing help with the other? I think so. I think travel writing has made me a better novelist. I think it’s accentuated my grasp of texture, of experience, of immediacy, and how people can work. I can’t overstate the value of travel for any kind of writer. Why did you decide to use a pen-name for Nicholas and the Chronoporter? It seemed prudent. An established genre writer – like Cliver Barker or Neil Gaiman – can write a book for kids and people find that interesting. They seek it out. It’s almost as if they’ve descended from Olympus to impart some small gift to the people of the lowlands. But if someone who is perceived to be a children’s writer publishes a conventional novel … that doesn’t seem to work. R.L. Stine – who started the bestselling Goosebumps line – did that. The book rotted on the shelves. So I decided to go with a pseudonym because I didn’t know which way my career was going to go, and I liked the idea of writing a book as a character. I’m hoping I can do more with Rowley Monkfish. I kinda like him. I’m represented by Howard Morhaim in New York. He’s had 30 years or more experience, is respected, and I like him as a person. I trust him, and it means I can spend less time sweating the fine print and more time writing. It just makes sense to have an agent like that onside. You not only get their experience, but you get their network of connections as well. How do you go about negotiating your contracts with your publishers? Again, that’s the value of an agent. Howard deals with them, gets back to me, we kick it around, and if need be there’s some back and forth. The idea of having to talk business with a publisher over the future of the current book … eurgh. Just, no. Can people buy ebook versions of your novels? The Music of Razors can be bought for the Kindle, via Amazon, if you’re in the US. I’d very much like to get everything happening digitally, globally, eventually. What’s happened in the past with publicity and promotions for your books? Have you had much assistance from your publishers or have you organised everything? Somewhat oddly, it’s the popular and established authors who get the bulk of the publicity budget. First-timers, mid- and back-listers get practically zip. So it’s up to them to generate their own publicity however they can. Since the financial meltdown pretty much every publishing house on Earth is fighting for its life, and they’re doing that via their front-list, so you can’t blame them for focusing squarely on the writers who pay the bills. But, that said, the front-listers have always had 95% of the budget. That’s not a new thing. Partly out of self-interest and partly out of genuine curiosity I wonder why companies don’t make a more concerted effort to promote up-and-comers, if only to protect the future of their corporation. I mean, Bryce Courtenay isn’t going to be around forever. Have you done a book trailer? Is this something you’d consider doing? No I haven’t, but I definitely would. Anything that helps keep people aware that you’re still here doing your thing is valuable. Whether or not it’s cost-effective is something else entirely. But yeah, I’d definitely do it. An editor may ask that the main character of your period drama be more like Starscream from Transformers. I wish I was making that last bit up. Brian K. Vaughan said that writer’s block is just another word for computer games. The time lost playing just one of those things to completion, if you add it up, is shocking. Furthermore I find the repetition of action and visuals blunts the mind and makes it harder to work afterwards. It pains me to say it, because I love the escapism of gaming, but I’d advise throwing out all of them, then travelling for three weeks to flush my head and reset. Then returning and getting started on something fresh. And to remember that everything will take three times longer than I expect. Cam’s YA novella, Nicholas and the Chronoporter, is in print with Penguin Australia. It was written under the pen-name of Rowley Monkfish. His first published work, a YA novella entitled The Vampires, has been in print with Lothian since 1997. Cam is currently travelling and working on his next novel. His most recent sales were articles on Wave Gotik Treffen in Leipzig and Sun Studio, Memphis, for The Age. Click here for Cameron’s website/blog. And here for paperback edition of the Music of Razors on Amazon. Here is the link for The Music of Razors on Kindle. Today, I’m talking to author Cameron Rogers. Cam has had two novels and two YA novels published. Currently he’s travelling and writing travel articles for newspapers such as The Age in Melbourne. Cam’s unusual background includes being a motion capture model for computer games and a ‘crime management officer’ for the Queensland Police. Cam, can you tell me how you first came to be published? The short story is this: in the mid Nineties I’d been writing and trying to sell stories to magazines for a while, so when Gary Crew asked to see some of my stuff I had a catalogue I could show him. He liked what he read, suggested I write something for Lothian’s After Dark series, and it went from there. 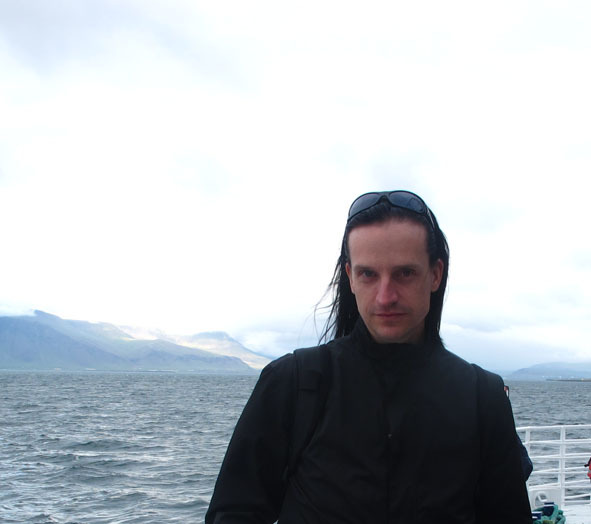 I learned years later that, apparently, Gary took to me because I was a Goth but, strangely, wasn’t a wanker. I hope he doesn’t mind me saying that. That first publication got Penguin interested, which led to The Music of Razors, Nicholas and the Chronoporter and my current one, Fateless. I’m hoping that’ll be out within twelve months. How did you approach Lothian and Penguin Australia when you started out? Was there a particular method that’s worked for you? I’m not someone who networks easily. The idea of schmoozing, of meeting new people with some selfish ulterior motive, squicks me out. Then I realized that ‘networking’ was just code for ‘having friends’. We help each other out, it’s all good, and when we’re not doing that – which is most of the time – we’re just doing what friends do. I keep an eye out for the lateral, the beautiful, the unexpected. Do you ever encounter obstacles (in terms of craft) when writing for publication? Only when writing stuff for kids. They don’t need to be patronized, they’re fine with being challenged, but the parents and librarians who buy the books often don’t seem to think so. So it can be a balancing act. Nicholas and the Chronoporter almost didn’t see print because part of the plot involved the main character dealing with the death of his mother, for example, and then being presented with the chance to save her at great cost to everyone else. That right there almost killed it. How do you tackle research for your fiction writing? I do, and I’ve learned it’s possible to research to a fault. There’s a real craft to knowing when enough is enough when it comes to info-mining. Too little and the book feels flat or doesn’t ring true, too much and it either paralyses you with choice or you disappear down the rabbit hole of researching the details of your research, ad infinitum. I fell into that trap working on my latest book, Fateless. A section of the book has to do with the ‘Pals battalions’ raised by Kitchener in WWI. I was so engrossed by the idea of fathers and sons and brothers and cousins – the male population of entire families sometimes – being recruited and banded together and then shipped off to the front lines, that I felt I’d lost the right to use their stories if I didn’t do it justice. I lost a year on that, only to realize that if I supplied just enough detail the reader would get it; that less really can be more, and that maintaining a good signal-to-noise ratio is absolutely critical. I have two credos when it comes to travel: Say Yes, and Embrace Random. It doesn’t matter how fascinating you think the subject is, if too much research makes it to the final page you run the very real risk of fatiguing, and losing, the reader. Apart from visiting the place you’re writing about, how do you research your travel articles? I probably do about as much research on a destination as any other traveler. I have two credos when it comes to travel: Say Yes, and Embrace Random. Those two things, I’ve found, have generated more interesting material and experiences than any amount of reading-up and planning. Everywhere I go I take a Moleskine notebook and a camera. I keep an eye out for the lateral, the beautiful, the unexpected. I note down odd things that are said, little details that snag the attention, and photograph anything that suggests itself: sights, sounds, smells, textures, observations, snatches of conversation. Then at the end of the day I write about it, for myself, using the notes and photos as aids. I realized that ‘networking’ was just code for ‘having friends’. At some point later I read back over all that material, isolate the articles that seem the most interesting, and then I rework those for publication. It’s really about capturing the immediacy of the experience. At the end of the day all anyone has is the experience of something, and for me the soul and purpose of good travel writing is to convey your experience to someone who can’t be there. That requires an eye for the hidden, the unexpected, the taken-for-granted, the poetic, the lateral. The tiny thing that makes the moment. I could talk about the Eiffel Tower, for example, or I could talk about gangs of scruffy men on Parisian street corners selling cartons of stolen cigarettes and stashing their supply inside cast-iron art deco lampposts. The Eiffel Tower is common knowledge, shared culture, wallpaper, but you can smell those men. You wonder about them, who they are, their pasts, why they do what they do, how that slots with the life of the neighbourhood. It’s new, unseen … it’s engaging. I’ll put up the second part of Cam’s interview on Friday. Cam talks about why he used a pen-name, the benefits of having an agent, and what promotions support writers get from publishers. In the meantime, click here to visit Cam’s website/blog. He’s got some great photos of his travels.